This download video features tricks that Stephen teaches over a course of lessons, and are often used as a showcase piece in a talent show at the end of the course. 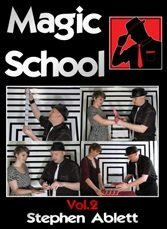 They are all simple to master and great for any beginner in magic. Guess Who: Characters are eliminated until your left with one, that matches your prediction. Vanishing Me: Using the template found in the data folder, make a person vanish. Grid Prediction: A random number is calculated which matches your prediction. Unburstable Balloon: A needle is pushed into a balloon, but wont pop until you want it to. Broken Skewer: A skewer is broken inside a towel, yet magically restores. Key to the Ring: A key is hidden among others, yet you can find it through touch alone. Light Heavy Boxes: Somehow lifting one box is heavier than lifting three. Five Away Cards: A simple card trick where you find the chosen card, with multiple stages. Spelling Bee: You are able to find all eight cards by simply spelling them out. Coin Thru Hanky: A coin magically passes through a handkerchief. Candy Sticks: You can make eight candy stick boxes balance on top of each other. Pencil Thru Handkerchief: A pencil is poked through a handkerchief, yet leaves it unharmed. Travelling Cash: Money moves from one pile to another pile invisibly through the air! Out to Lunch: The stickman drawn on a signed business card mysteriously vanishes. Hanky Thru Arm: A hanky is tied around the spectators hand, yet it passes straight through. Safety Pin Thru Hanky: A pin is pushed and torn through a hanky, yet it is left unharmed. Ralphs Trick: A picture vanishes from three cards and appears on the spectators card. Rising Ring on Band: A ring rises upwards along an elastic band. Banana Split: Using your telekinesis chop, you slice a banana in pieces, while still in the skin. Magic Envelope: A card s torn to pieces, placed into the envelope, then magically restores. Vanishing Coin: A coin is counted, seen and heard going into the hand, yet it has vanished. Business Card Printer: Two cards are shown blank on both sides, then become printed. Rope Thru Body: You are able to make a rope pass through the spectators body. Ten Card Poker: A simple game of poker is played, but you somehow win every time. 1st edition 2014, length 2 hours 11 minutes.